This might be the most important one we’ve featured here. 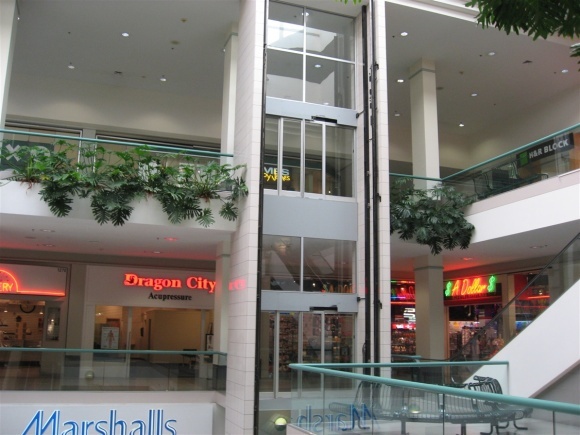 Southdale is the mall that started it all, from the man who started it all – Victor Gruen. 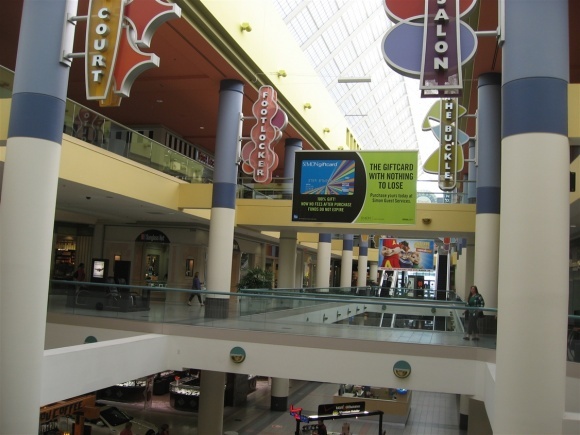 Sure, there were shopping centers and arcades, bazaars and this and that all over the world predating Southdale, which opened in 1956, but Southdale was the model for everything that came after. 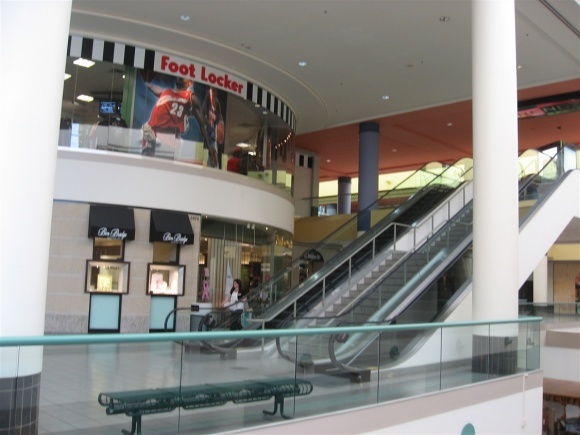 Southdale transformed shopping in America, shifting it away from downtowns and into the suburbs. Furthermore, it was built by an eccentric, energetic visionary, Victor Gruen, whose socialist ideals for retail development were infiltrated, bastardized (Gruen’s word!) and changed by American capitalism, giving us the frenetic retail landscape we know today. He had some major help from U.S. Congress, though, who in 1954 passed a bill to stimulate manufacturing in America; instead, it unwittingly created the retail building boom and hastened a cultural change in the built environment as we know it. 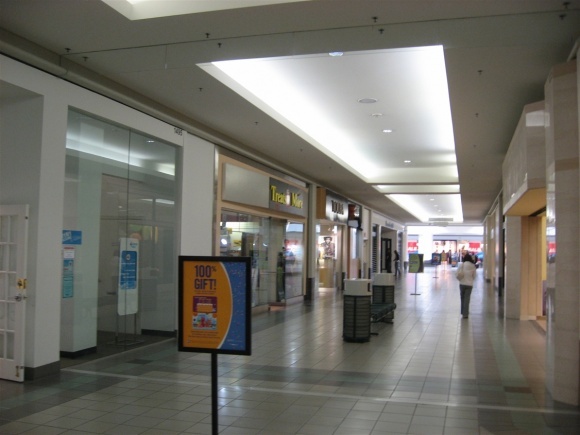 Before 1956, there were certainly shopping centers, plazas, and arcades dating back to the dawn of humans. 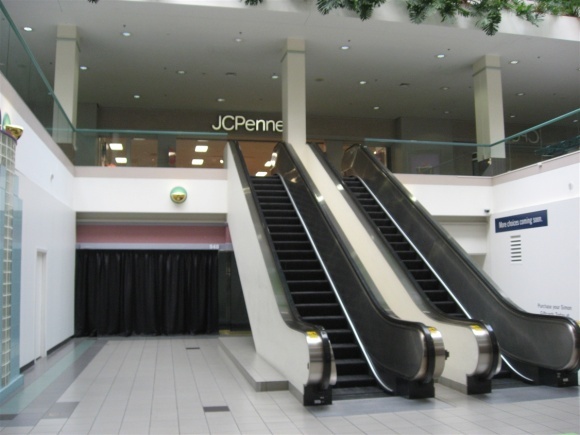 There were even similarly “modern” enclosed shopping malls predating Southdale, like the Westminster Arcade in Providence, Rhode Island, which opened in 1828, and even the modern Valley Fair Mall, which opened in Appleton, Wisconsin in 1954. 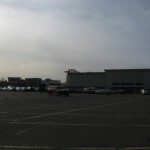 And there were others yet, to be certain, such as the Northgate Mall in Seattle, which is said to be the first shopping center to coin the term mall, and opened in 1950. The idea of grouping like businesses in a marketplace dates as far back as history itself, and we’re not arguing that Southdale started this at all. 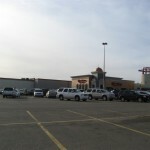 Southdale did, however, pioneer the grouping of like businesses with the idea of providing a controlled, sustained, uniquely socialized community under one roof. 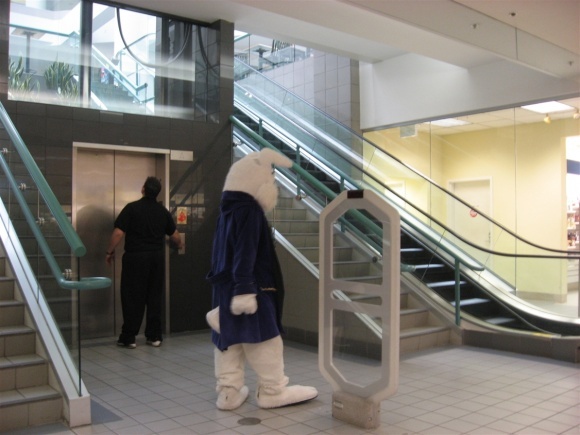 Anybody can throw up a mall, sign some leases, and be on their way, but Gruen gave malls meaning; he’s largely the reason we have any collective attachment to memories of malls at all, and also the reason this website exists. 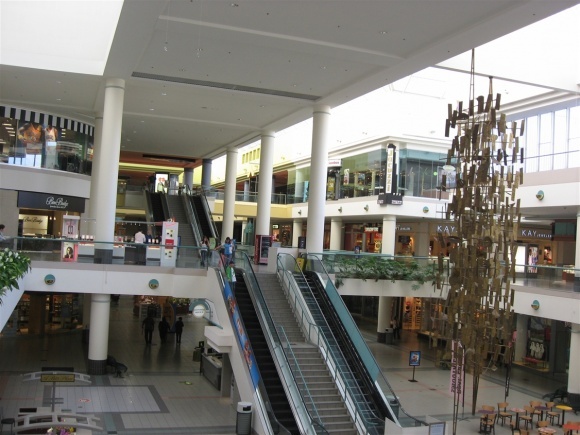 Every mall in America and the world has followed his model, working to improve it along the way, and his original ideas have even given rise to the modern ‘mixed-use’ development popular in today’s new urbanism. Southdale’s creator was mall mastermind Victor Gruen, an Austrian Jew who fled to the United States in 1938 during the Holocaust. Gruen grew up in a privileged class of artists, and before the war he attended the Vienna Academy of Fine Arts for architecture and performed in cabaret theatre in Vienna’s vervey night club scene. When he arrived in New York, with “an architect’s degree, eight dollars, and no English” – his own words – and immediately formed a cabaret troupe. Then, one day Gruen ran into one of his old friends from Vienna in midtown Manhattan, and the old friend hired him to design his new Fifth Avenue leather goods boutique. When designing the boutique, Gruen trademarked his famous Gruen transfer, innovating the way stores were designed and the way people shopped. 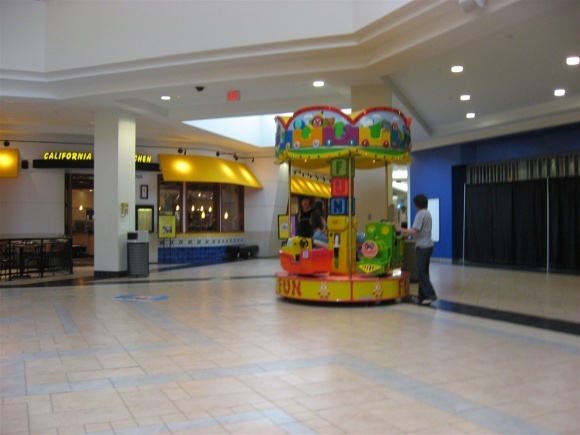 Instead of the traditional shop layout with entire store space flush to the street, Gruen created nuggets of interest in the entryway in the form of mini-arcade. The nuggets were a scripted disorientation, drawing the shopper in. 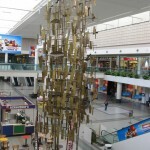 The Gruen transfer refers to the moment when a consumer enters a shopping environment, and, surrounded by an intentionally confusing layout combined with music and an elaborate decor, loses track of their original intentions. The effects of the transfer include a slower shopper pace, glazed eyes and, of course, spending more money. The design was an instant hit, driving sales through the roof at the boutique, and Gruen spent the 1940s designing more stores around New York in the same manner, perfecting his Gruen transfer at this smaller scale. 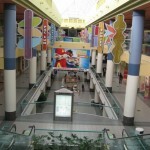 Then, in the early 1950s, Gruen turned his sights to the American suburbs and designed his first large-scale suburban-style shopping center near Detroit for J.L. 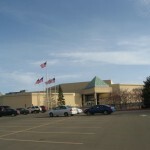 Hudson department store, Northland Center. Hailing from Austria, Gruen was a socialist, and viewed the suburban built environment of post-war 1950s America as ugly, brutalist, and lacking in spaces where people could congregate and linger. All the retail strips that popped up weren’t pedestrian friendly and didn’t encouage people to stay at all; instead, people drove their cars up and down the street to patronize individual businesses, using the ample seas of parking in and around every building, all the while not interacting with each other as they ran in and out, to and from their cars. Gruen bemoaned this, and wished he could create a prototype community where he still had the control of building a suburban shopping mall but also with a real sense of community infused. Gruen saw pieces of his Vienna in American downtowns, which had the critical mass necessary for his model but were beginning to die and lose out to suburban developments, so he knew he had to act fast. Also, Gruen felt he could improve on downtowns by building his own in the suburbs, and perfecting the mistakes that were made. The way Gruen saw it, downtowns were organic developments, and, over time, they developed mistakes that could not be easily controlled by a planner – the extant built environment built its own pattern, and you couldn’t just put a large parking structure wherever you wanted, or place like businesses in adjacency like you could in an environment you built yourself. 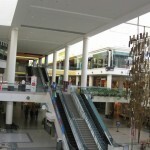 So, Gruen embarked on a grand experiment in retail with Southdale Center, which broke ground in Edina, Minnesota – a southwest suburb of Minneapolis – in 1954. 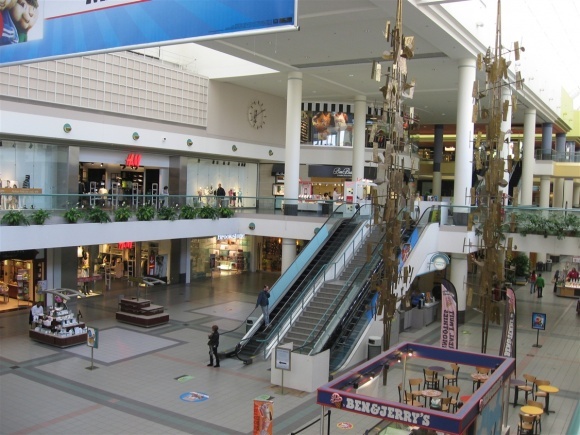 Southdale was, in Gruen’s view, not an alternative to downtown Minneapolis, but what downtown Minneapolis could be if you ironed out all the mistakes and could build it all over again from the beginning. 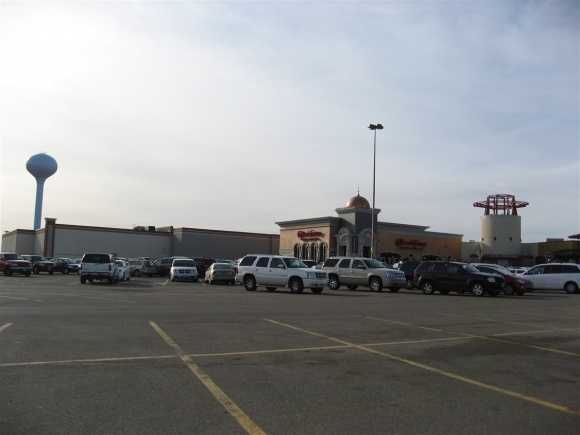 The Southdale development was not supposed to be only a retail development either, but a mixed-use development as well, one of the first of its kind, combining all of the ingredients of a model city – retail, residence, offices, medical facilities, recreation, schools and more. 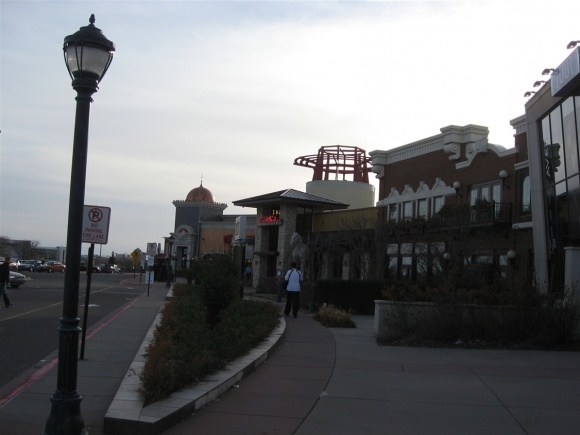 Gruen, like many other retail developers, also took advantage of a tax loophole in a recently enacted federal law. In 1954, Congress passed a bill accelerating the tax depreciation process for new construction. They did this to stimulate the manufacturing industry, which had slowed a bit since World War II, in order to construct new factories with new technology. This law applied to all new construction, though, not just factories, and commercial real estate investors used it to make fat profits from new retail construction. Before this law was enacted, it took an investor a long time to reap profits from new construction, but after the law assed, he or she could set aside a signifcant amount of the profits of the business tax-free. This is the basic way it worked: it was assumed by the government that buildings would last approximately 40 years, so an investor could take off 1/40th the value of the building each year tax-free. 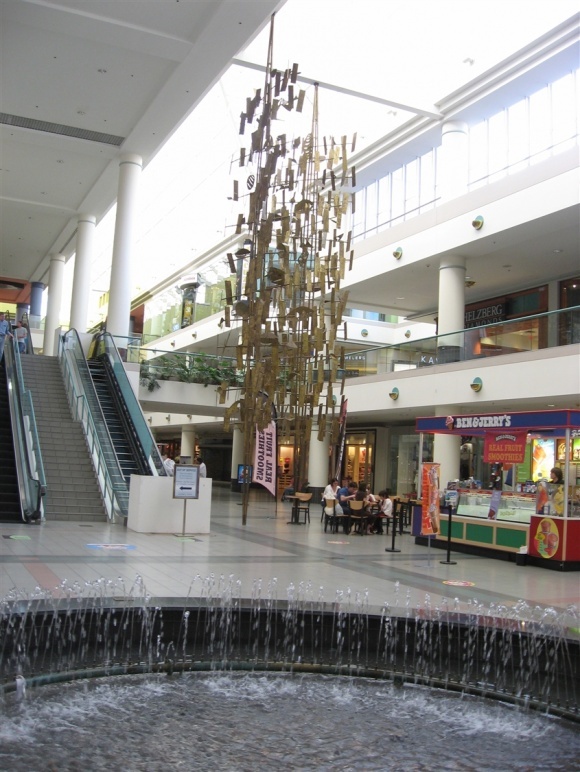 This rewarded investors for building new malls, because the depreciation of the building’s value in the first few years was enormous, and they could reap a likewise enormous tax savings. Some developers even routinely operated at a tax loss this way, even though they were making tons of profit. This law was a major catalyst for the glot of retail and suburban new construction which has taken place ever since, changing the retail built evironment exponentially instead of gradually. 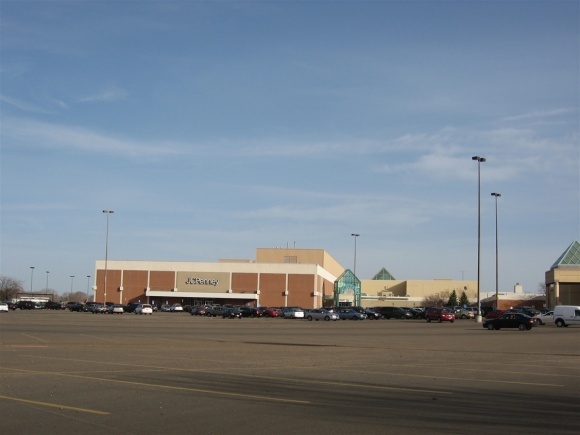 Southdale opened to impressive fanfare on October 8, 1956, to 40,000 visitors as well as national press that included a story in Life Magazine. 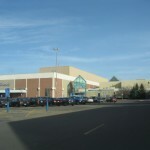 The centerpiece of the Southdale development was a two-story, 800,000 square-foot enclosed mall, anchored by two Minneapolis-based department stores – Dayton’s, who financed and developed the mall, and Donaldson’s – along with space for 72 in-line stores, including majors Woolworths, Walgreens, and a Red Owl grocery store. 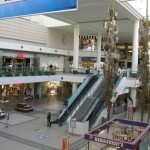 At the time, an enclosed mall was a dramatic departure from the outdoor malls popping up all over the country, but Gruen reasoned that an enclosed mall would be beneficial to this development, and his means, for several reasons. First, an enclosed mall would suit Gruen’s means of providing a built environment encouraging the social, community-inspired culture he wanted to import from Vienna. 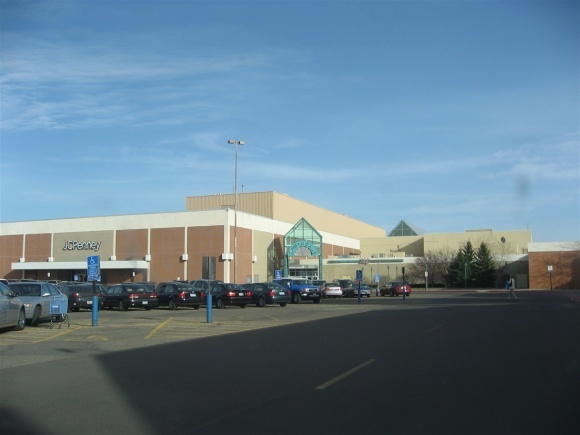 It would provide a gathering place for not only the residents of Edina, but for the greater Twin Cities as a whole, and as such also invented the super-regional mall. Gruen also wanted Southdale to be an entire community, too, so he placed much more than retail in this initial development. Many useful services as well as recreational leisure-time activities were combined with retail under one roof, giving Minnesota residents not only respite from their long, cold winters, but also no reason to go elsewhere. 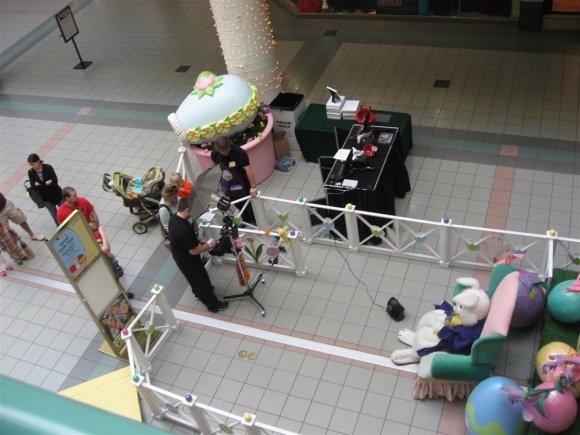 These services included a large restaurant in the middle of the mall, a post office, ample tropical foliage, a petting zoo, statues, fountains, stages for community events, pageants, trade shows, and even a game show hosted by none other than Bob Barker. 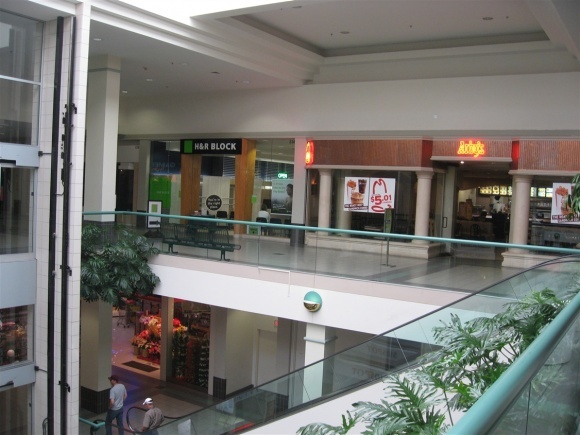 All of these accoutrements were in Southdale’s wide, enclosed Garden Court, which ran the main length of the two-story mall on the first level, connecting Dayton’s to Donaldson’s. Gruen also exiled cars from this enclosed development because he felt they were noisy and rude, which was a strong stance in post-war suburban America where cars were king, but Gruen felt they did not help his communal vision. 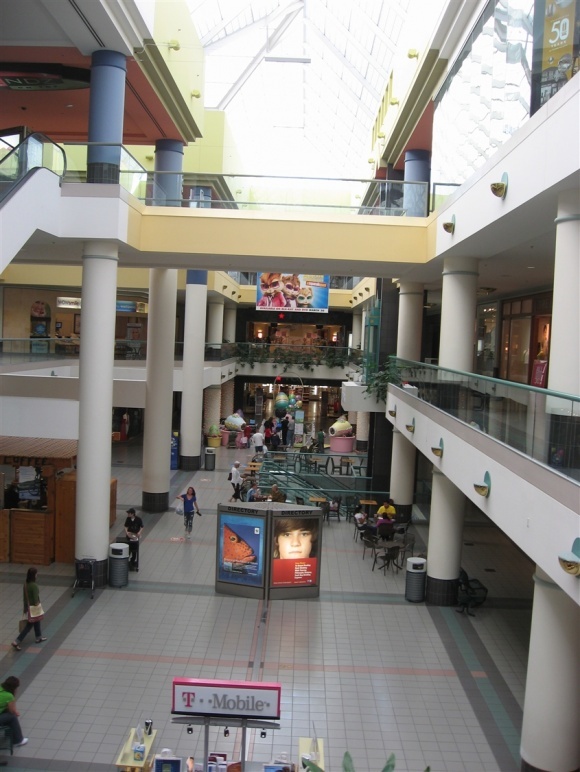 To effectively house this enclosed community-of-tomorrow, Gruen designed Southdale with a more socialist lilt than modern-day malls. 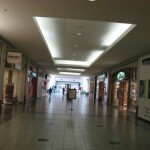 The main mallway, Garden Court, is impressively wide, which became Gruen’s trademark style when designing malls. 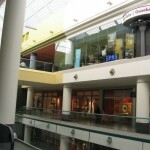 This design allowed for the functional space necessary for all the non-retail activity taking place at the mall. It also gave a more human, communal element to the mall – listening to the sound of people laughing and enjoying each other in the middle of the mall while eating at the restaurant in their shirt sleeves in January imprinted warm, fuzzy feelings upon the shoppers’ subconscious. 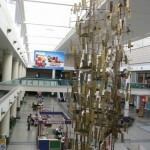 To this end, Gruen also installed public art in the mall, as well as two large bird cages which lasted until the 1990s. 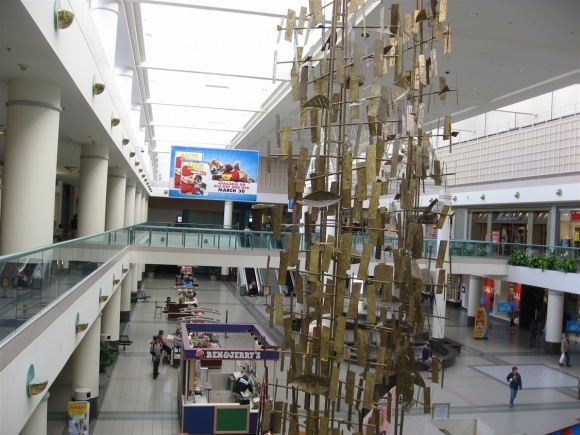 Some of the original art, including a two-story metal sculpture which hung in center court, is still there today. 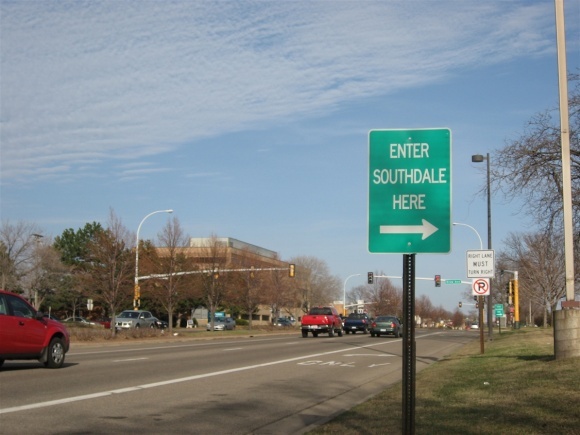 As time progressed, Southdale was copied both locally in the Twin Cities – by Brookdale (1962), Rosedale (1969), and Ridgedale (1974) – as well as nationwide. 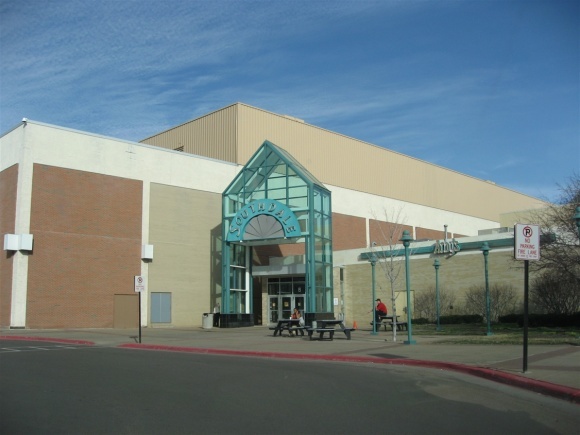 In response to this competition, Southdale embarked on an expansion that added a three-level addition northeast of the original mall. The centerpiece of this addition was a brand-new 247,902 square foot JCPenney. 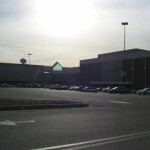 The new addition was connected to the original mall via two disparate hallways on different levels, one on the first level and one on the second, both of which led to the JCPenney court. 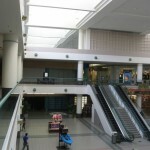 Also, a basement court was built in front of JCPenney with more retail space connecting to the Garden Court through the basement. 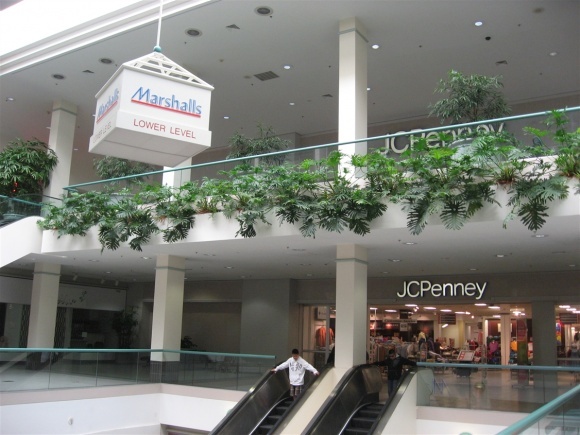 This space would eventually become a 44,000 square-foot Marshalls, which had entrances leading out toward the basement court in front of JCPenney as well as escalators leading directly up to the original mall’s Garden Court. 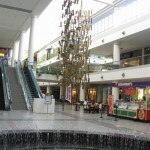 This addition was complete in 1972 and gave the mall a totally unique, yet architecturally incoherent layout. We think it’s amazing, though. 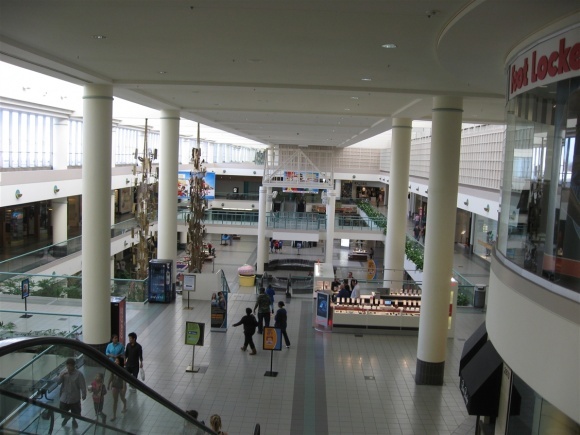 Gruen’s original vision for Southdale as being much more than an enclosed mall was unfortunately never truly realized – the area around the mall did develop a hospital, residences, and recreation, but it wasn’t as organized as Gruen would have liked, and it wasn’t self contained. 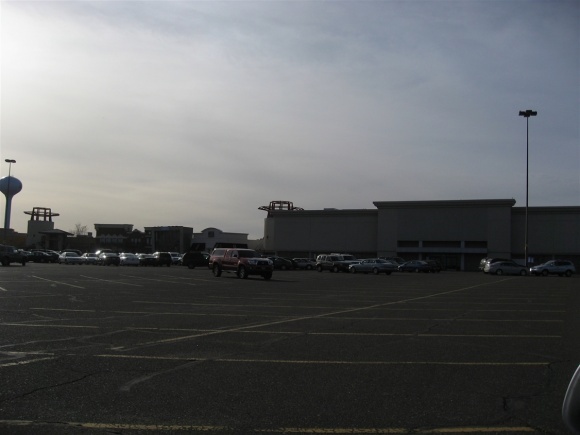 Also, France Avenue south of the mall became the nightmarish car-oriented antisocial strip Gruen abhored, and strips like it popped up around nearly every other mall that copied Southdale in the years and decades to follow. 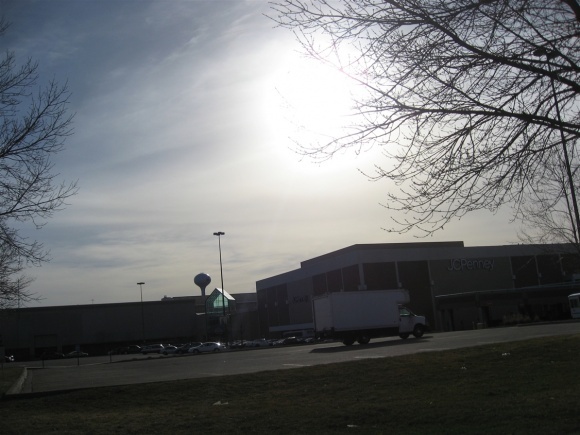 In fact, in the early 1980s, a 417,000 square foot mall, anchored by a Gabbert’s furniture store, popped up just a few hundred feet of Southdale. 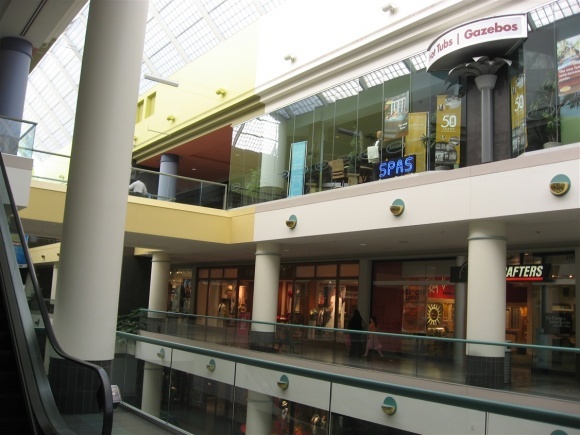 Galleria Edina was never a major competitor to Southdale, though, as it houses mostly upscale boutique stores in a mix of half local to half national. 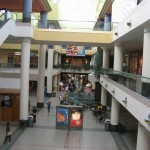 Gruen also eventually grew to loathe malls themselves. 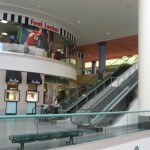 Near the end of his life, in the late 1970s, Gruen remarked at what a travesty modern retail was, and how much it had diverged from his ideal vision, perfected in theory. 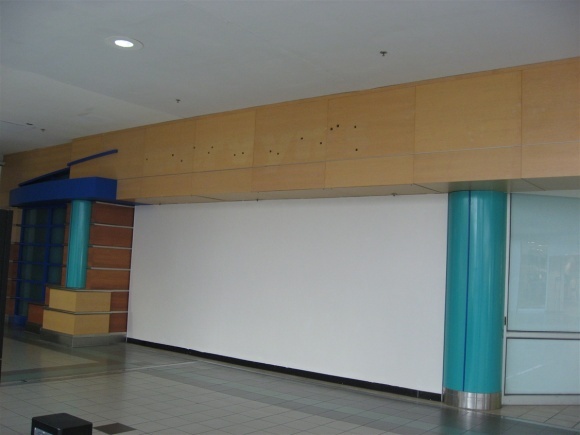 Gone were the wide berths of central space in enclosed malls – they were too expensive to construct. Gone too were the public artwork, zoos, supermarkets, restaurants, and other public spaces in American enclosed malls, and gone before they were ever constructed were the full realizations of the mixed-use projects intended to go with these malls. 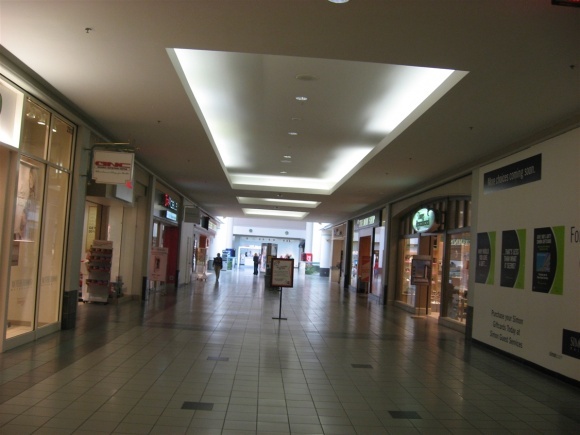 Even though new malls were being constructed at a breakneck pace, the corridors got narrower and the warm, fuzzy accoutrements began to disappear. 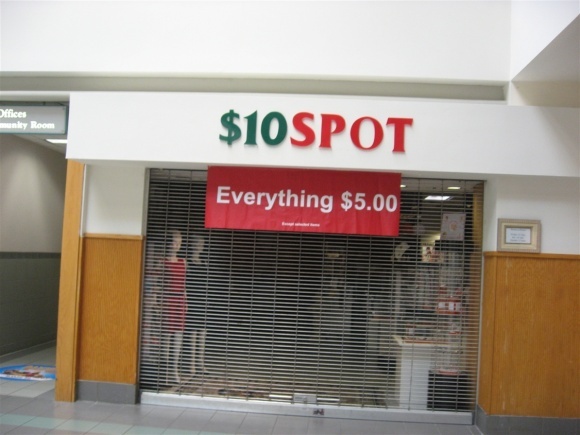 The typical kiosk-laden mall of today, with a minimalist design and the removal of most extraneous decor for maximized profit, would certainly send shivers down Gruen’s spine. Disillusioned and disgusted, Gruen left America and returned to Austria a broken man in 1978, torn up by the soul-less, antisocial, monoliths of dispassionate retail development surrounded by seas of parking lots malls had become. 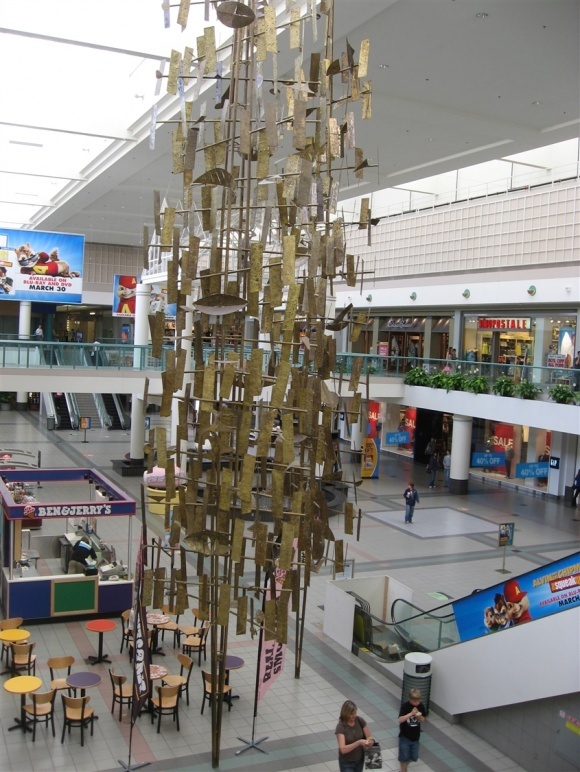 At the very end of his life, a mall even opened in the suburbs of Vienna, and he called it “a gigantic shopping machine” with none of the community-inspiring amenities he imparted in his designs. Ironically, the mall began to kill the downtown Vienna culture he wanted to share with the world. Instead of bringing a little Viennese socialism and culture to America, Gruen unwittingly brought American capitalism to the world. 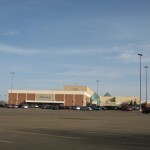 Even before Gruen’s death in 1980, Southdale lost much of its originality and charm, becoming lost in the sea of shopping options in the Twin Cities – a testament of Southdale’s influence. 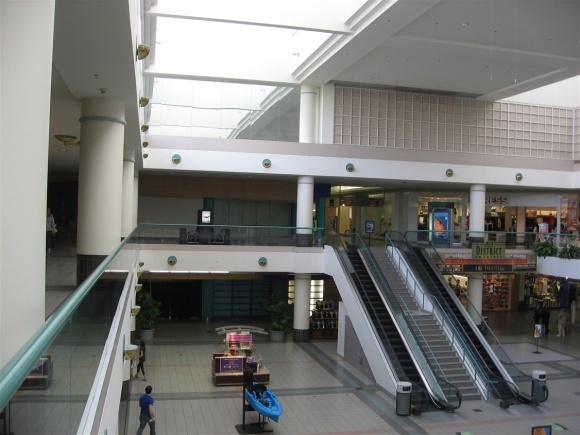 By 1980 there were 8 super-regional shopping malls in the Twin Cities, and in 1992 the biggest mall in the country opened just four miles away – the Mall of America. In yet another tale of Mall David and Mall Goliath, where one can expect predictable outcomes, Mall Goliath usually wins and Mall David usually dies, either slowly or catastrophically. David is sometimes redeveloped, and occasionally saved due to proactive management and an oddly quirky set of locals who might even prefer it. Thankfully, this was one of those cases. 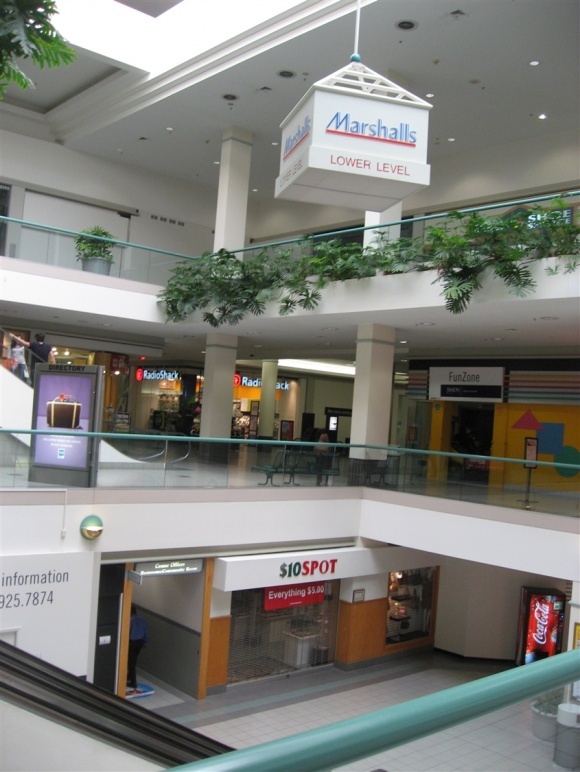 In 1991, a full year before Mall of America debuted, Southdale’s owner saw Goliath appearing on the horizon and decided on an expansion and renovation. 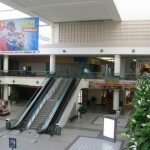 Dayton’s, the northwest anchor and original mall developer, moved to a mammoth 359,000 square-foot four level store adjacent to its original store, and the old store was gutted and turned into three levels of mall space in a new wing extending southwest of the original Garden Court. 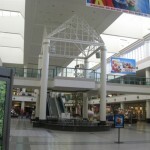 This addition also included a large food court at the end of the new southwest wing, on the third level, and an expansion of the Garden Court. A new parking deck was also added. 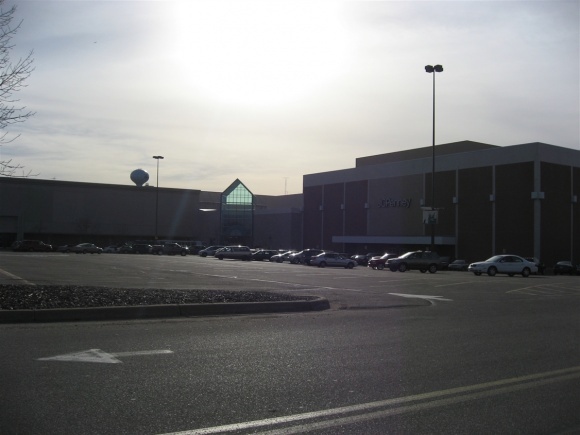 This expansion and repositioning allowed Southdale to compete against the Mall of America, and as it turns out shoppers were much more fickle about dealing with the mammoth mega mall four miles to the east, and preferred shopping at a more convenient mall close to home. To Southdale’s delight, it held its own against the Mall of America, and being located in one of the nicer, monied areas of the Twin Cities certainly didn’t hurt. 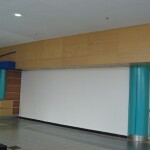 Some notable anchor changes have also taken place at Southdale. Fairly early on, the Red Owl supermarket was kicked out, and in 1987 the Donaldson’s chain went out of business – most became Chicago-based Carson Pirie Scott. However, Carson’s was unable to make their Minnesota stores profitable, so they sold them to then-Minneapolis-based Mervyn’s, a discounter that was originally from California but was purchased by Minneapolis-based Dayton-Hudson in 1978. Meanwhile, Dayton’s was converted to Marshall Field’s in 2001 when Dayton-Hudson (now renamed Target Corporation, after their most profitable venture) wanted to combine all their upscale department stores under one banner, and decided the Chicago-based Marshall Field’s name carried the most clout. 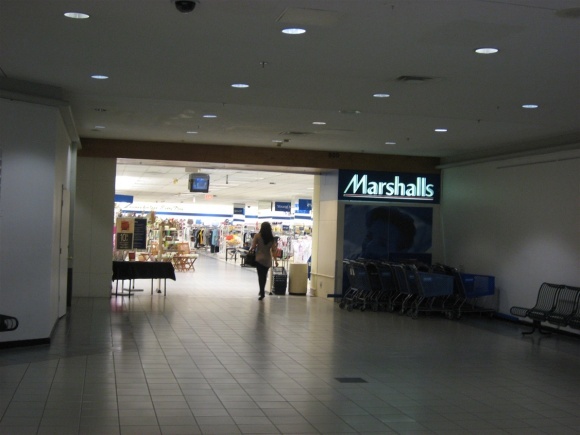 Then, in 2004, Target wanted to get out of the upscale department store business and focus on Target, so they sold Marshall Field’s to May Company and Mervyn’s to a capital management group. 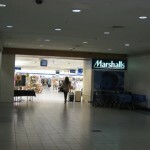 May then sold Marshall Field’s to Federated in 2005, who converted all of the Marshall Field’s to Macy’s stores in 2006, and the new owner of Mervyn’s decided to exit the Minnesota market completely in 2004. 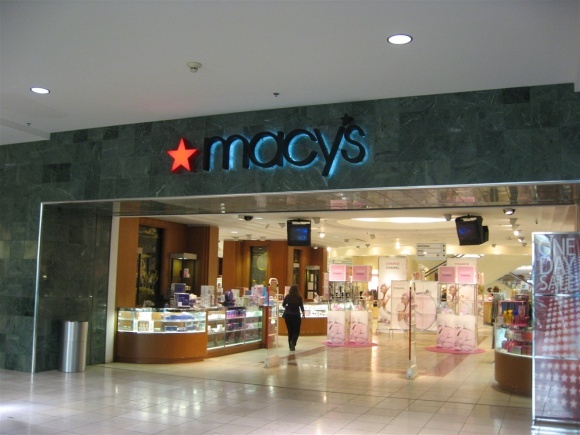 Today, Southdale is anchored by Macy’s, Marshall’s, JCPenney, and dead. 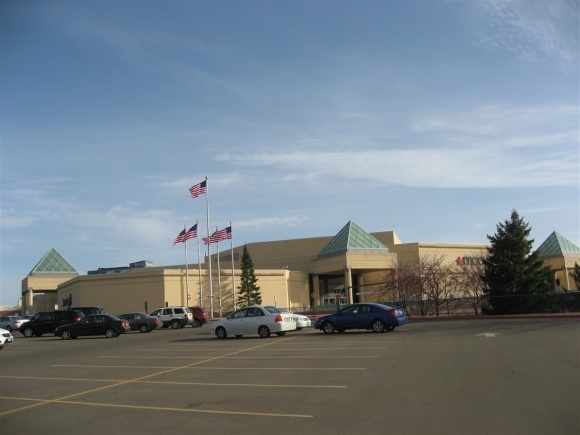 The next expansion and repositioning at Southdale took place in 2001-2002, coinciding with the dramatic renovation of Eden Prairie Center, a super-regional mall located just 6 miles southeast of Southdale. 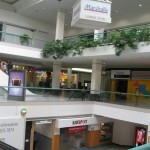 Eden Prairie Center, which was featured in the movie Mallrats, had fallen on hard times during the 1990s. However, developers realized the area around Eden Prairie Center, one of the wealthiest areas in the Twin Cities, could support a redeveloped mall, and they tore most of the mall down – sans anchors – and rebuilt the entire thing. 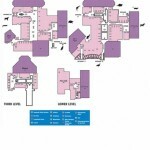 They added mid-level as well as upscale stores, including the upscale Iowa-based Von Maur department store. 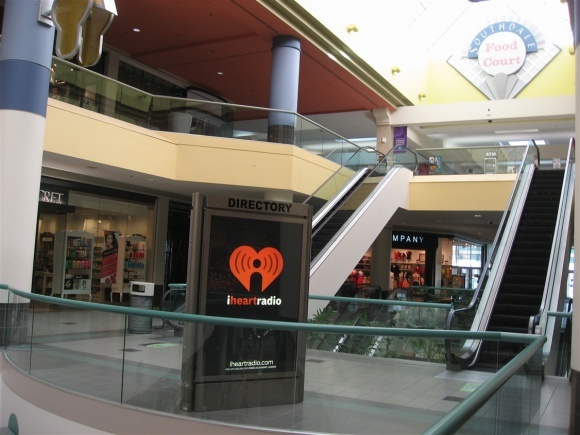 All of this was bad news for Southdale, sandwiched in between Eden Prairie Center, the Mall of America, and successful Ridgedale Center, so another expansion and repositioning was in order. 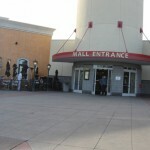 Southdale’s owners constructed a multi-million dollar lifestyle addition onto the mall’s south end in 2002, but instead of mainline retail they added mostly destination restaurants and entertainment options instead. 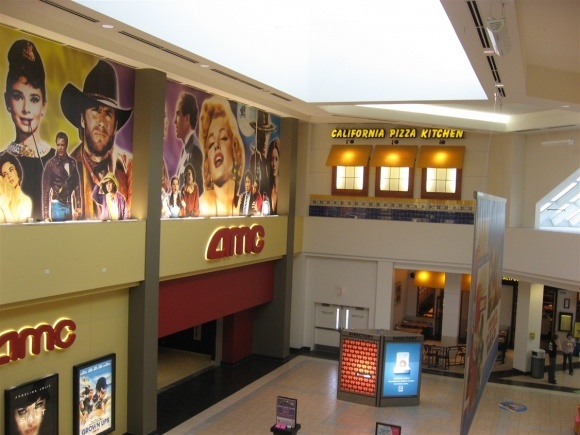 They were keenly aware that bringing more than retail to the mall would be a boon for its future success, so they brought in a 16-screen AMC Theater, California Pizza Kitchen, Maggiano’s Little Italy, PF Chang’s, Cheesecake Factory, and Ruby Tuesday. It was given the name The District on France. 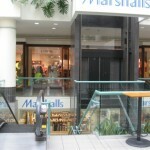 At the same time, they focused an area of Southdale’s third level, between the Garden Court and the food court, on teen-oriented fashions such as Pac Sun, The Buckle, and Zumiez. Called Trendz on Top (I know, kind of dorky, right? 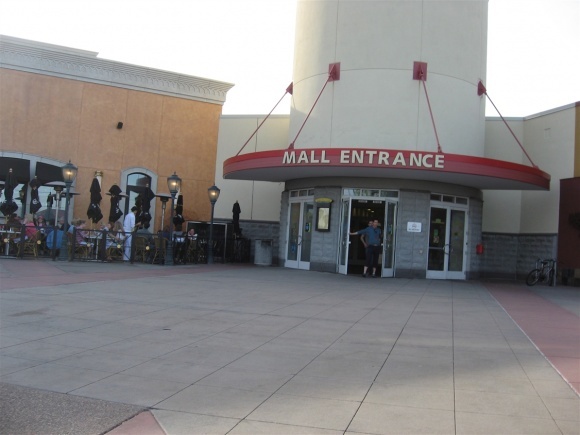 ), the newly focused area not only made use of an area of the mall which might have become neglected, but gave teens a specific reason to go there, dragging their parents through the rest of the mall. Trendz on Top premiered about the same time as The District on France, between 2001-2002. Since the most recent addition, Southdale has struggled a little due to the economy and competition, and its vacancy rate has ticked upward. 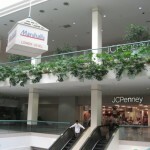 In 2004, Southdale received a major blow as the southern anchor Mervyn’s closed when that retailer pulled out of Minnesota. 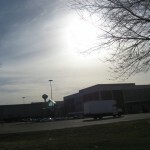 As of April 2010, it is still vacant; however, in 2006 the Mills Corporation, who owned the mall at the time, proposed another renovation and expansion at Southdale that would have brought a Nordstrom to the space, as well as a ‘lifestyle center’ addition to the mall and possibly even Neiman Marcus. Unfortunately, though, Mills went broke and was acquired by Simon. 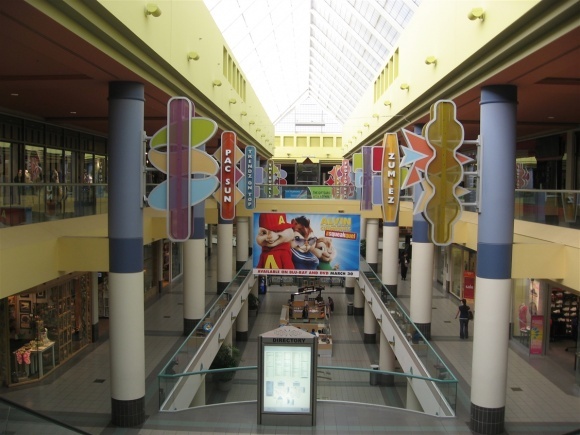 Simon is better poised to manage the mall, and also talked of renovation as recently as 2008, but the economy has ultimately shelved these plans for now. 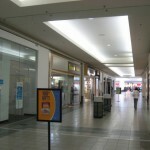 Southdale is still a viable, popular mall, but ever since the economy tanked the vacancy rate at Southdale has ticked up, and as of January 2010 was 22 percent. This is not an alarming figure, considering the economy, and Southdale still has many destinational and upscale stores, including an Apple Store, H&M, Coach, J Crew, Banana Republic, all of the restaurants, and the 16-screen AMC. 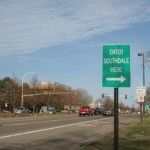 However, despite these popular destinations, parts of Southdale are extremely troubled. 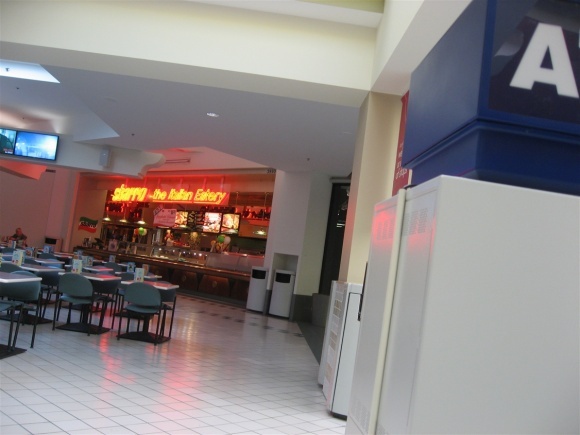 The three-level JCPenney court is pocked with vacancy, a dollar store, some services, and an ancient Arby’s, and across the mall the gigantic food court only has two remaining stalls open. 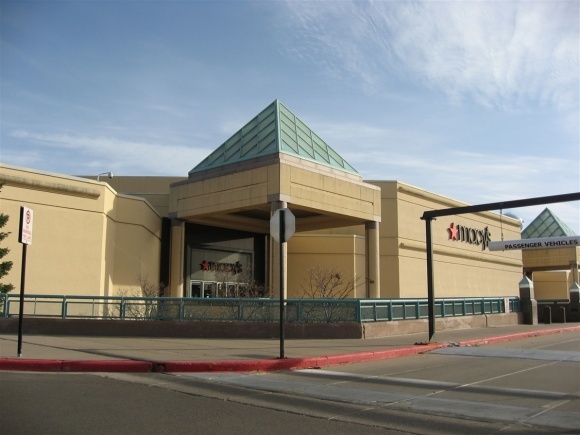 In addition, in 2008 Crate and Barrel jumped ship and moved a few hundred feet away to a two-level location at the Edina Galleria mall, and in early 2009 Maggiano’s and B. Dalton closed. 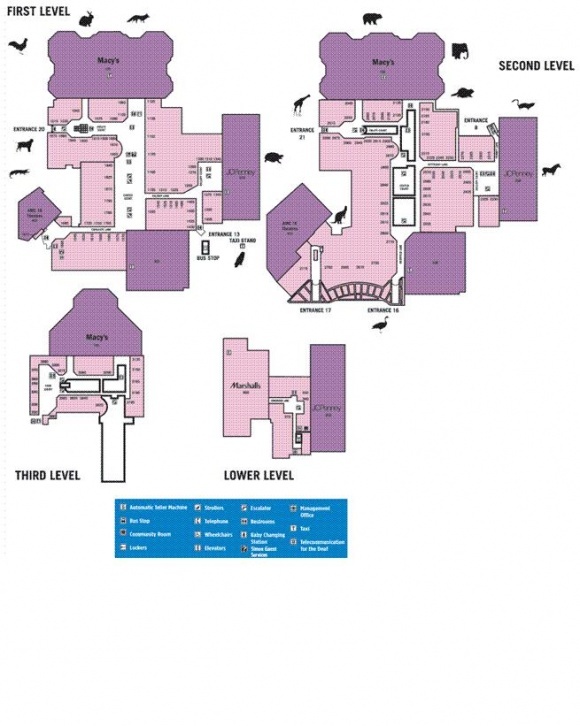 Most of the central Garden Court as well as the three level wing in front of Macy’s is well-tenanted, though. 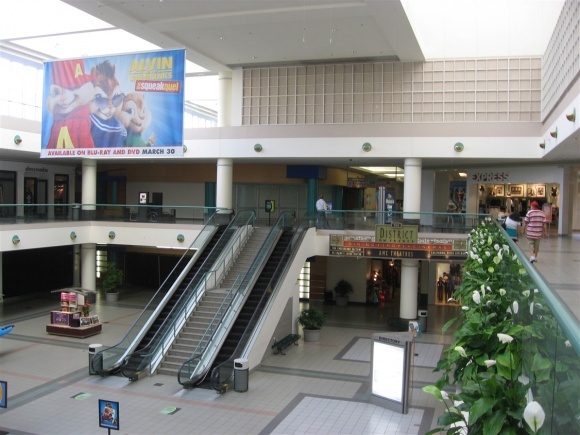 Caldor and I visited Southdale on one of our first-ever mall trips in 1998, and I’ve been back many times since. Gruen might not be proud of what his vision ultimately created, but even he couldn’t deny that his influence did at least some good. 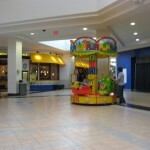 I mean, we created this site, and we all appreciate and have fond, warm memories of the malls of our youth. The photos below were taken in April 2010. I encourage you to leave your own comments about Southdale, Twin Cities retail, or Victor Gruen; we appreciate them. 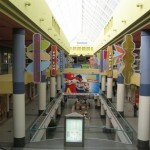 It’s a damn shame to know that Gruen’s idea of a community around a mall didn’t hold to his vision, but I don’t think he would be surprised either to know that the enclosed mall concept that he once envisioned and later hated would start to wither away by the late 1990s and moreso today. I wonder what he would say about lifestyle centers though if he was still alive. 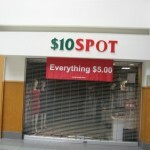 Gruen Malls always had great attention to detail. I love the parking lot animals. The problem with a lot of ‘socialist architects’ is that they fail to realize an economic case needs to be made for mall design decisions. Malls are at their basis a very closed machine for retail, and if it’s not good at that then that fancy landscaping becomes a liability. As much as I hate lifestyle centers, this is why they’re popular- their ‘modular’ design that doesn’t require X amount of anchors to stay successful and they can take on a more ‘organic’ form as retail conditions change. I wish more developers would try to push the mall concept forward, but oh well. That 90’s renovation is not aging well either. This thing needs to be updated. Interesting how the Minneapolis area is home to the largest enclosed mall in America* and the first enclosed mall in America. 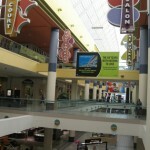 * King of Prussia Mall is two malls connected by an outdoor walkway. 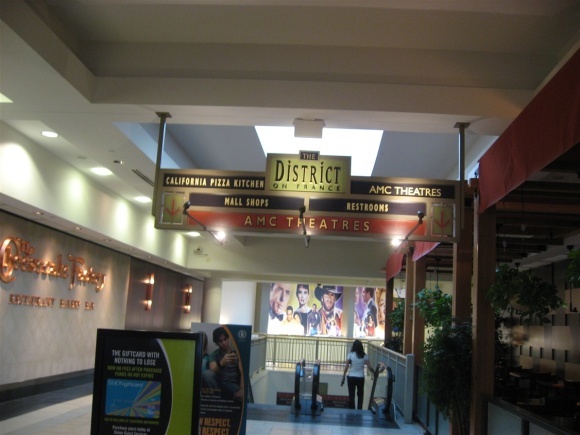 Also, I think this mall reminds me of Palisades Center in a way, it’s not so much the space as it is the decor, some elements like the signs with the store names on them. 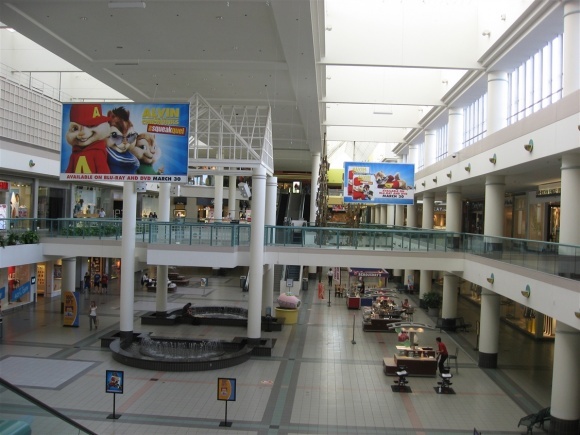 Perhaps if they did more things to the interior to make it more exciting, it could go head in head with Mall of America and its entertaining vibe. 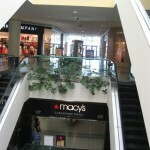 Southdale has a great Macy’s. 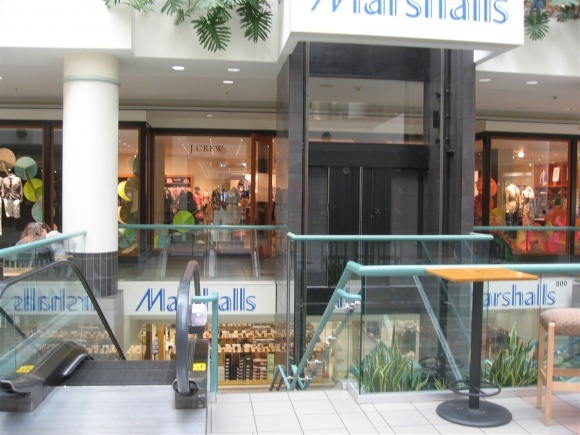 I used to work at Marshall Field’s and the southdale location was always duking it out with the Downtown Minneapolis for 2nd highest sales volume behind the State Street store. 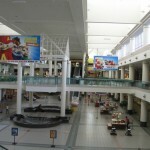 I love the mall and hope that Simon comes up with a viable remodel for this mall to replace the Vacant anchor and update the penney wing. On the note of Twin Cities retail, as someone who lived there for 5 years, you grow to hate the MOA, you basically only went there when people from out of town were visiting. Southdale and Rosedale mall are so much more shoppable. Funny before you posted this I did not even realize nobody had posted photos of this mall today. 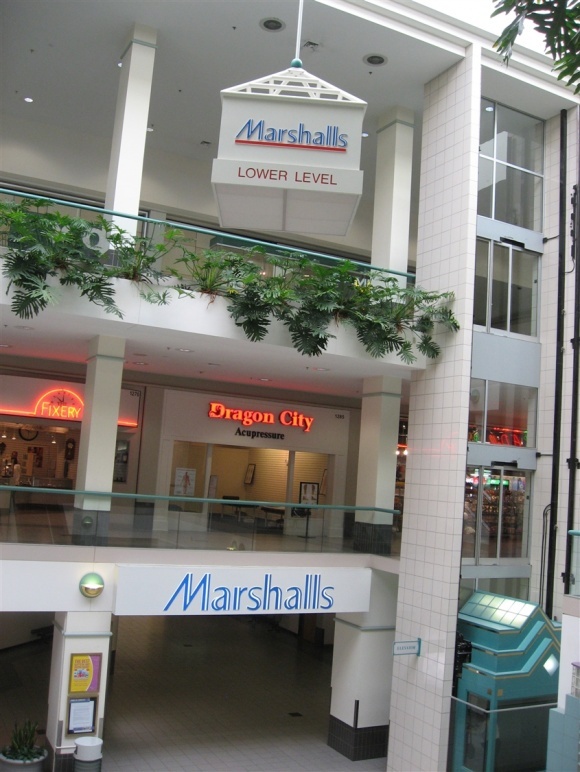 Even though I think it is incredibly cool, I tend to think that if vacancies get worse that in order to save the original Gruen Mall perhaps they need to demolish the three-level addition. This would consolidate the successful stores into a smaller structure, which would keep it viable longer without threat of losing a historical landmark. Quite honestly it sounds like the area is a bit overmalled. I’m assuming the local economy there for years must have been spectacular to keep so many large malls alive like that. 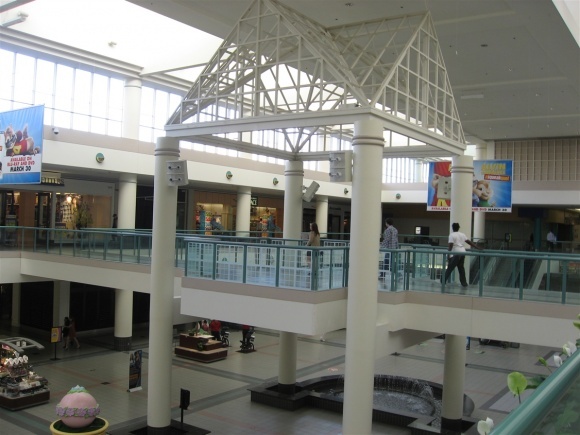 Of course, in my suggestion of tearing down in addition, I say that as somebody who wishes that Lenox Square and Phipps Plaza could somehow be joined into one mega mall lol. 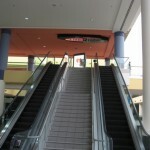 @JT, They should skywalk Lenox and Phipps together somehow, that would be amazing! They’re only about 1000 feet apart, and they’d only have to go across 2 streets. 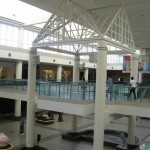 Somerset Collection in Michigan has a skywalk connecting the two pieces that is about 500 feet long, and crosses the two parking lots as well as a 6 lane boulevard. @Prange Way, Atlantans would still want to drive. There are grade issues that would make this difficult–they’d probably need to do something with Lenox’s Peachtree Street lot, which is sunken from the road, where as Phipps is on higher ground. It would wind up being >500 feet and rather complicated. Phipps has had a lot of ups and downs. It mmight make more sense for Lenox to take over the strip next door that used to have Tower Records (a really crappy one) and expand in that direction, perhaps incorporating the nearby hotel. Phipps has had its ups and downs and is no longer the Tiffany property it once was. Replacing it with something else wouldn’t be the end of the world. 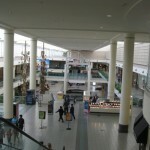 @JT, As someone who formerly lived in the Twin Cities Metro for 10 years I can honestly say you get into the habit of going to the malls for everything, mainly because of the cold winters, but also because the ‘dales were just really conveniently located wherever you happen to be in the metro. 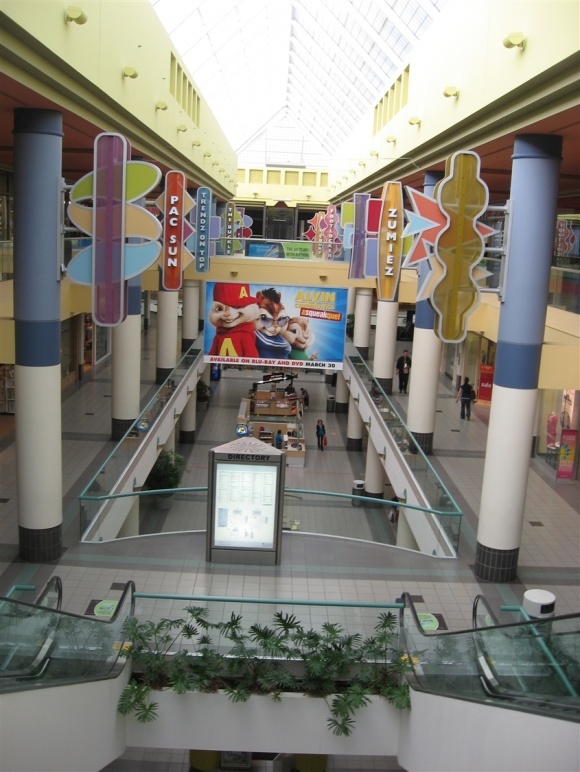 As for Southdale, I studied it pretty closely in college while studying architecture at the UofMN and honestly there’s very little of anything of historical value left in the mall after years of renovations. At least it was all hidden to my eyes before I left for the greener (and warmer) pastures of Atlanta. I’d have to dig for my old papers and pictures to be sure, but nothing sticks out in my memory. 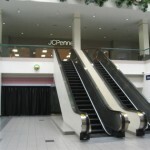 I agree the JCP wing needs to come down, or be gutted and connected better to the original space and be less dungeon like. @BK, While the mall today seems architecturally much more bland (much like Lenox), you can still tell it is the same basic structure. 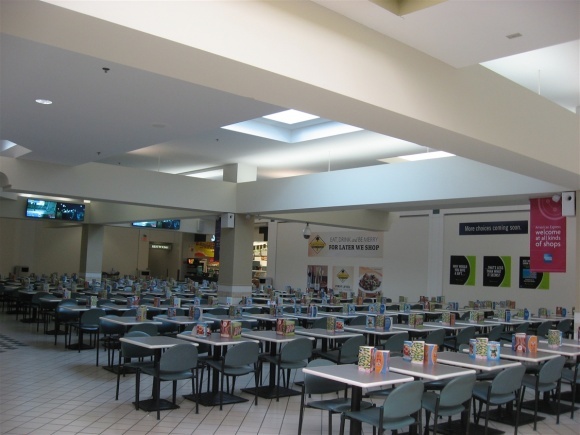 To me, what really destroyed some of the effect aside from the bland remodels is what they did with the overhead skylights. 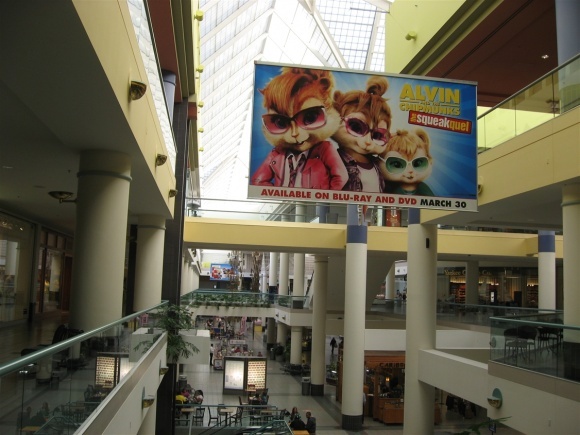 It looks like they had some kind of screen over them originally that muted the light to give it a golden glow…something apprently only done in the earliest malls. Today, that is just a plain old overhead skylight. The wood paneling is also noted to be lost. Perhaps if they tore down the addition, they could restore the mall to how it looked in 1954…I imagine the retro look would have some real appeal to shoppers if you asked me. 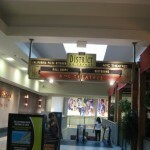 @JT, I agree with restoring it to its original state…complete with original decor. They could make it look like a retro version of what Northpark Mall in Dallas is like. 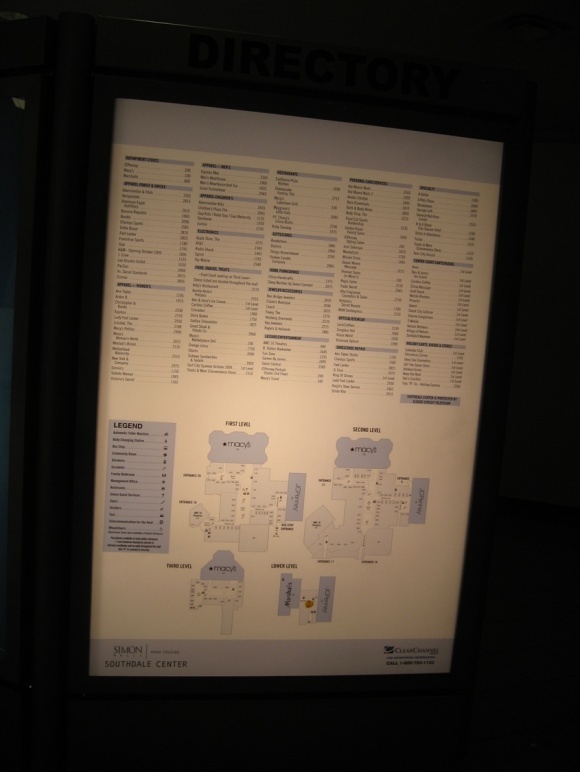 Look at the pics of the inside of that mall and then look at what stores are there. Neiman’s, Barney’s, Dillard’s, Nordstrom….. Mall interiors since the 90’s have looked like they were designed and decorated by 10 year olds…and made to only appeal to 10 year olds. People make fun of 60’s and 70’s looks…but they had much more class than this crap. One striking element can be sene in the above photos. 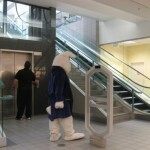 I meen the white staircases between the escalators. 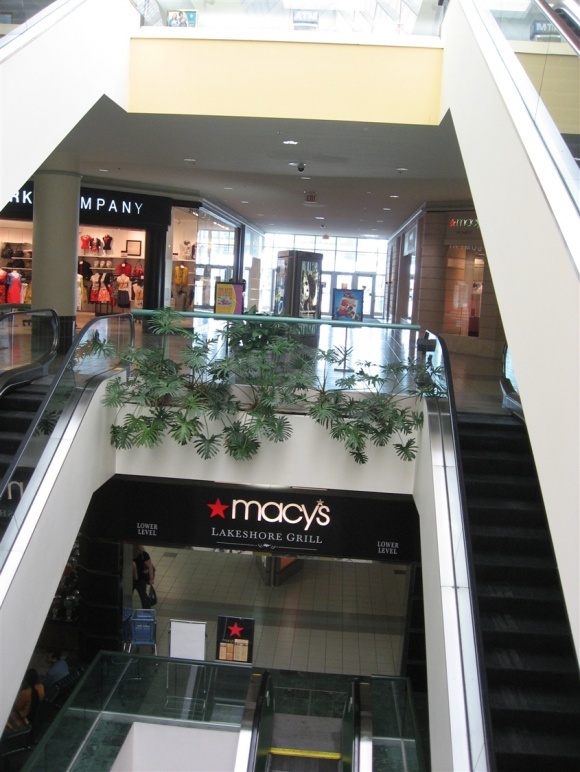 For some reason durring the 1950s & 60s, malls & menny department stores would not only have a center escalator, but also a stairwell with off white tile & stripes marking the edge of each stair. 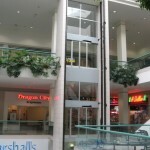 The Kohl’s in Port Chester NY had this feature when it was a corvets & remained through it’s Caldor days. Also gimble’s/ Stern’s at Roosevelt Field had this feature. Today that store is Dicks/ Bloomingdale’s Home. 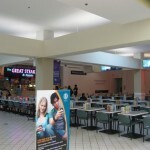 How can there be only two tenants in the food court? 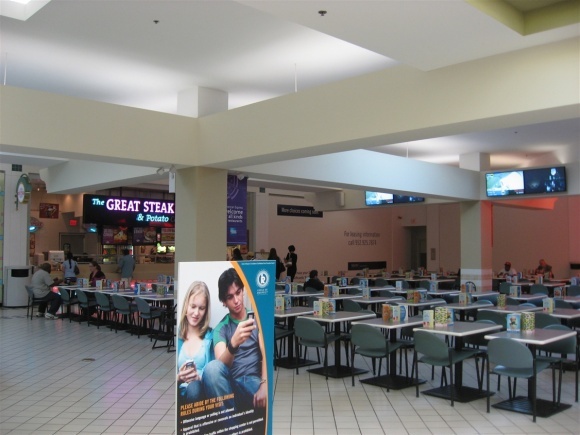 I’ve seen half-empty malls that still have more or less thriving food courts. Are they charging too much rent or something? 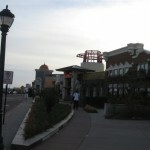 @Will, it might have more to do with the presence of all those restaurants such as PF Chang’s and the Cheesecake Factory. It wouldn’t hurt them if they just did away with the food court altogether. 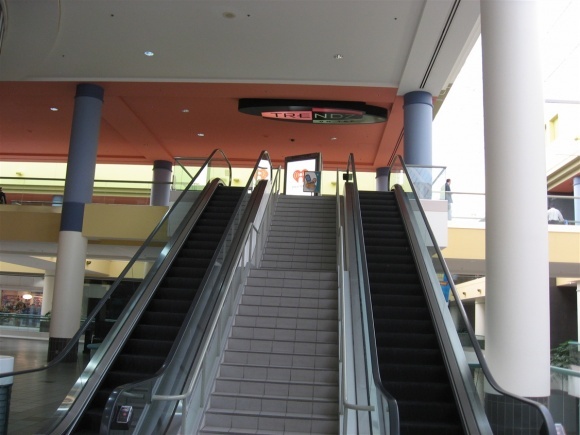 @Gary, It probably also hurts that the food court was tacked on to the top floor, Usually (but not always) food courts work best when near a mall entrance. This is a great post. I love Labelscar. I think it’s been a while since he updated this wing of his gigantic website, but he still has some worthy pictures up there. 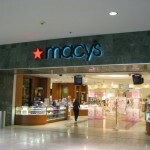 Aside from the newish Macy’s and typical but decent looking Penney’s, i hate what they’ve done to the place. A renovation to restore what was lost in the Garden Court is in order. 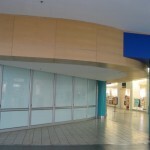 Gladwell has two distinctions that slay Southdale’s competition: it was enclosed and introverted. 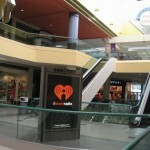 Meaning, that Gruen could control the weather inside the mall, and that the mall only exposed retail to the inner area. Valley Fair was not so much enclosed, and was extroverted. 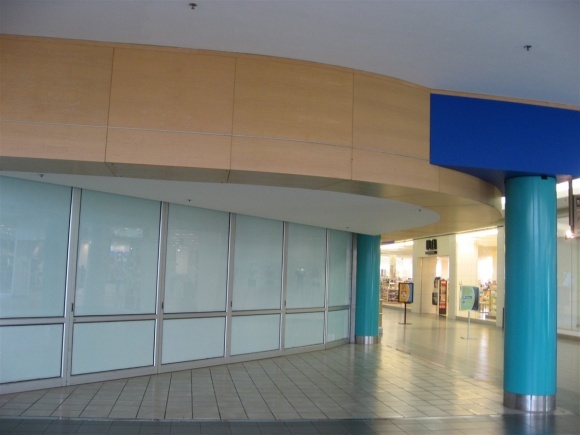 Northgate wasn’t enclosed until 1974, by which time the Gruen concept mall dominated the American social imaginary. 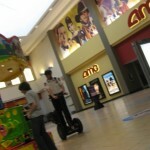 After substantial archival research, it is difficult to seriously entertain any challenge to Southdale being the first. wonderful photos! I grew up in Bloomington and Southdale was my teen hangout. 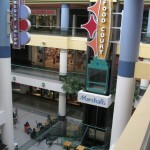 I forgot about the birdcage – that was always our “meeting place” if my family or friends separated to shop. My friends & I could also take a bus from Southdale to downtown Minneapolis to shop & eat and just spend the whole day exploring downtown. It was safe back then for 13-14 year olds. 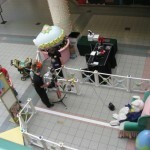 Does anyone remember the Southdale “Alice In Wonderland” display next to the birdcage back in the 60’s? They had a little door especially for kids & a larger one for adults to go into a fantasy set from Alice in Wonderland. I would love to see pics if anyone has them. I remember the Alice in Wonderland display. Actually, every year at Christmas all of the ‘Dales’ malls would set up Disney story-themed displays that guests could enter and wander through. I can only vaguely remember them, but as a kid we looked forward to it every year. I think the various malls would rotate their themes from year to year. 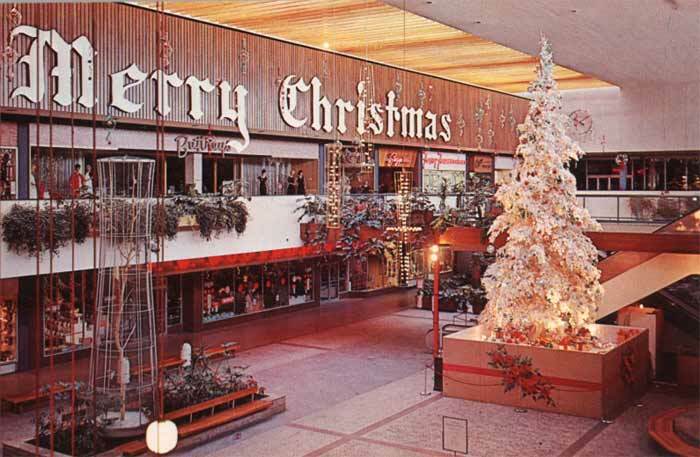 We used to go out to visit all of the malls each year to see these displays. Great family memories!! I sure would love to see some photos of those days!! 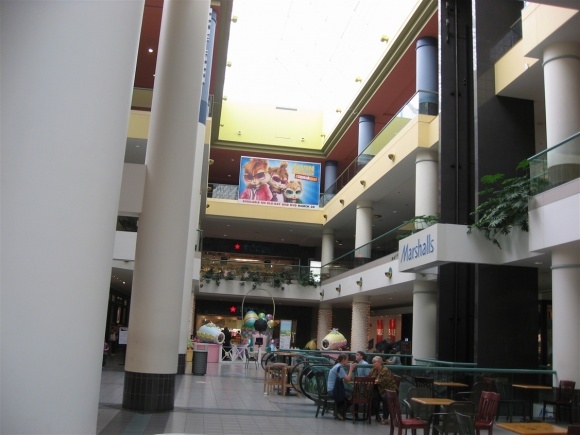 As the nation’s first enclosed, climate controlled mall, Southdale is an historic place, and I’d love to see Southdale restored to its original design and decor. 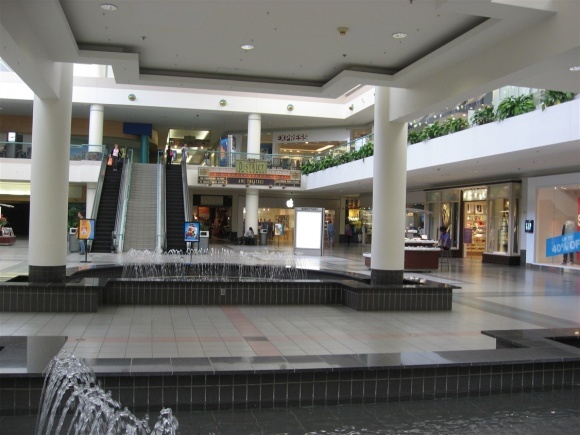 Southdale has significance to those of us who love architecture and history, and that in, and of itself, may become a big traffic draw, especially since Southdale is in an upscale area of educated, affluent people. Southdale is getting a Herbergers, a new food court (in the now nearly vacant JCPenney wing) AND they are streamlining the JCP wing so it flows into the main section, and is visible from the center court. I too wish they could saw off some of the weird, disconnected-feeling additions…but this is definitely a step in the right direction. 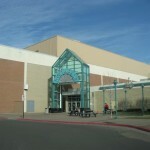 The best mall in the metro area. Forget MOA. this mall is not dead. there was like a million people lined up at the apple store. We didn’t say it was dead? 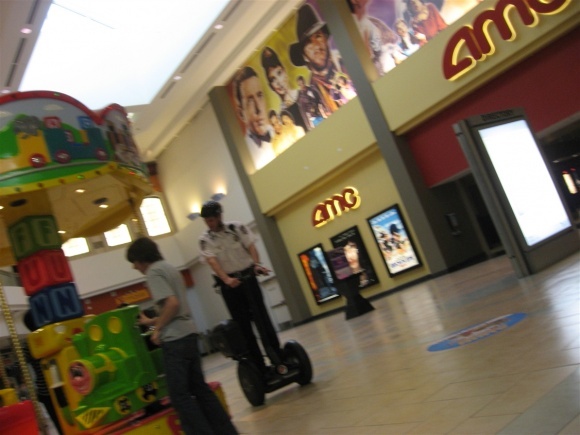 It’s not tagged with the “dead mall” tag, either. 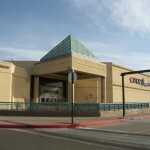 This isn’t deadmalls.com, we write about all malls and this one is even historically significant. Ahh. 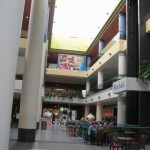 Fabulous Southdale Center. I was 20 when I moved to Minneapolis for school in 1988 and a frequent visitor to Southdale through the opening of MOA in 1992. 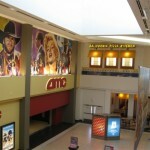 During the 1991 renovations, there were enormous life size photo panels of the 1956 version along with original full color architectural concepts that predated construction. They were on the floor around the garden seating at the base of the Aviary, (that’s what the descriptions in the panels called the bird cage). I only remember the one Aviary, and it never had live birds in it. By the late 80’s it had been painted a funky color and was incorporated more as a garden sculpture. The Garden Court really was an amazing thing of beauty if you grew up in cold snowy Minnesota like me. Other than a university stadium it was one of the largest open spaces that was heated and “green” with daylight that I had ever visited until I started traveling more in my mid 20’s. 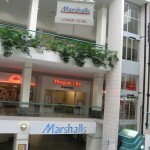 The version of Garden Court that I remember was much warmer than the current incarnation. Regardless of tenants store fronts, large sections of the upper elevations were paneled in something honey or fruitwood colored. And the overhead screen was really nothing more than wooden beams, or something painted to simulate wood spanning the exterior wall and the upper partition. It did cast a warm glow on the floors below, probably to warm up grey winter days, but with tropical plants everywhere also gave it a little bit of a polynesian tiki essence. I remember talking with family and friends who grew up in Southdale during the 50’s and 60’s and the renovations in 1991 were not really unwelcome. By the time this came to pass, the wooden handrails on the mezzanine and stairs and benches had become very worn. 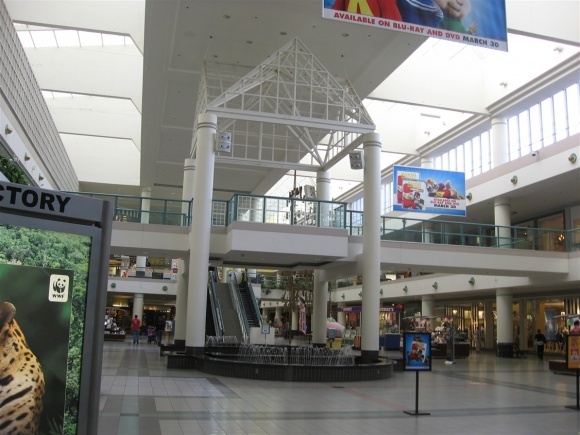 And even-though the sculptures and funky incandescent lighting were appreciated by lovers of mid-century architecture, the mall clearly needed a face lift if anything to make it more durable and “clean” looking. On my travels back to the homeland for weddings, funerals, work etc.., I inevitably end up back at Southdale to do a hit and run for dress shirt at Banana Republic or a power cord at Apple. Remaining architectural details are some exteriors on the former Donaldson’s store front, the funky clock over the Garden Court stairs and the two metal sculptures… I remember them being described in literature as “the Trees”; I’m sorry I don’t remember who the contributing artist was. Thanks for the absorbing website. 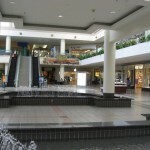 I grew up going to Southdale in the 60’s and 70’s. It was a great place to go. I remember the lunch counter at Woolworths, and getting a Matchbox car there or at the toy store that was across from it. The benches around the birdcage were a great place to hangout and the area with plants and some wooden statues of people on stilts, the goldfish in the fountain, A great hobby shop that was called Gage’s or something like that. Brown Photo where I got my first roll of film developed (still have them and the Brown Photo envelope), I remember a place in the basement walk that led to Penny’s that had all kinds of scary masks and stuff. I can still remember the smells and sounds of going there as a child. A few months ago, there was an article entitled “The Fab Five”. Published in “Inside Retail” magazine, the article references five inovative retail centers & Southdale was the first to be noted. I moved to Mpls back in 1994 and worked at a now defunct Museum Company part time as I was establishing myself. 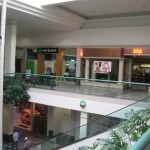 South dale was always my preferred Go To mall and still is. When I moved to LA in 2006 I left remembering SD as a thriving Mall with a lot going for it despite the MOA. Heck it even had a Mini Cooper car dealership / store In it. I recently returned to Mpls in 2011 and was surprised to find it a little sad and rough around the edges. 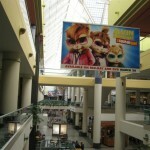 Apparently the poor economy and a revitalization of the MOA and Galleria had an impact. But glad to see a revitalization and remodeling taking place. Herbergers , a Carson Pierre Scott brand recently moved into the old Mervyn’s anchor and JCP is trying to rebrand….although it remains to be seen if they will succeed. The tiny Apple Store is always packed and a move by Apple to move to a larger space that is more prominently located in the center court of the mall would do a lot to help revitalize the mall in my opinion. 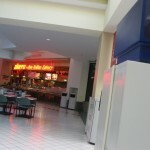 The attempted “teen” and food court area at the wing off Macy’s is not faring too well. 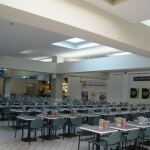 The food court is being relocated and many stores are shuttered there. Something else needs to be done up there. I have all hopes that South Dale will be fully revitalized as the improvements are made and the economy improves. It’s still a grand old Mall! In my earlier post I should have said that Herbergers is a Bon Ton company brand. Along with Carson Pirie Scott , Younkers and others I don’t remember the names of. Mark, I do know Bon-Ton also owned the last remaining Parisian stores in the Detroit area until earlier this year when they were rebranded Carson’s (which Carson Pirie Scott has been going by for a while now), also this month, the Carson’s nameplate was placed on the former Elder-Beerman (another Bon-Ton-owned store) at the Mall of Monroe (halfway between Detroit and Toledo) and the former Younker’s (which you mentioned) at the Birchwood Mall near Port Huron, MI. I’m surprised that despite our close proximity to Chicago (where they started), Carson’s/Carson Pirie Scott never had a store in Michigan until this month! Thanks Matt….interesting to hear. Makes one wonder how long they will try to maintain the many individual brands they own. Today from seattlepi.com’s Seattle history archive we share the story of the Northgate Mall – the nation’s first suburban shopping center to be called a mall, and the model of what has become common today. The news that what is now North Seattle would get a major shopping center broke Feb. 22, 1948. A corporation called Suburban Company announced plans for the $12 million mall – a roughly $96 million price tag today – on 60 acres. 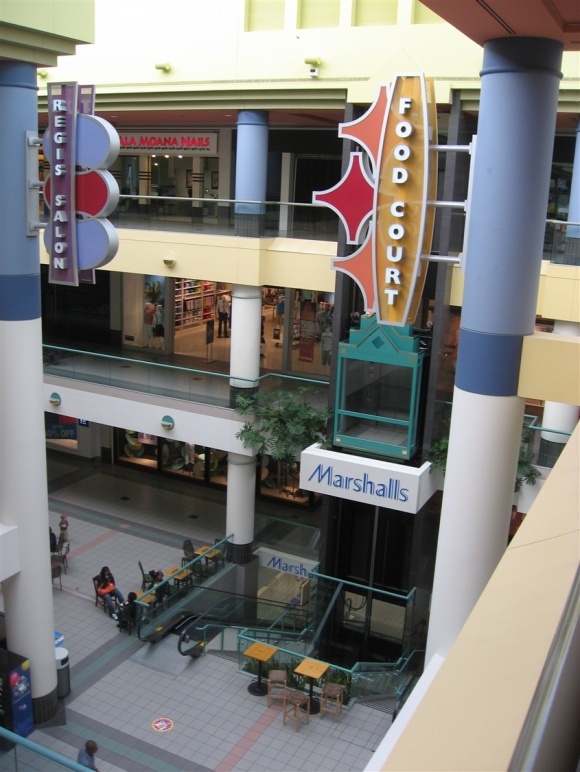 This mall was my favorite until its got renovated into the modern white floor/white wall look that all malls are going to now and carpet squares. 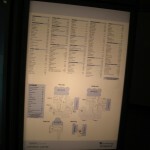 Its like being inside a health clinic more than a mall now. No color just white, dull and boring with no life to the atmosphere. I see MOA is also turning into the hospital atmosphere now too.